I‘ll be completely honest and tell you that I don’t even bother with meat on my summer pizza. Forget the pepperoni, ham, and yes, even bacon, during June, July & August, pizza is ALL about the glorious vegetables. And why would you want anything else? Silky, smokey grilled peppers and zucchini, firm young garlic, and sweet cherry tomatoes leave little to be desired for toppings. 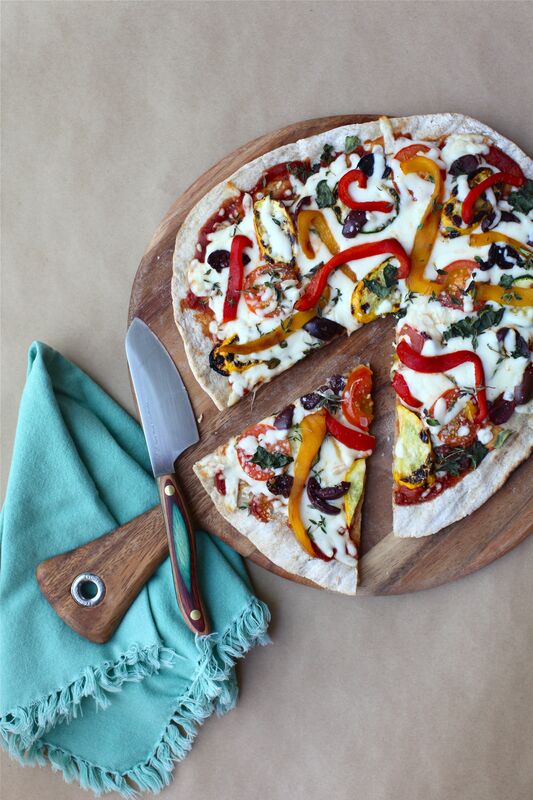 Winter pizza is another matter completely; for now, the vegetables deserve to shine. Herbs also play a role in summer pizza toppings, as so Kalamata olives for some balance, and the whole pie is bound together by whatever cheese is hanging out in the crisper. Two steps elevate a simple summer pizza from ho-hum to heavenly: the first is to grill the aforementioned sweet peppers before adding them to the pizza, and the second is to cook the crust directly on the grill. In this post, we’ll look at how to do both. It’s not so much the roasting of the sweet bell peppers that is tricky, but peeling them can be tedious – unless you use a snappy little trick I learned in culinary school which I’ll share below. 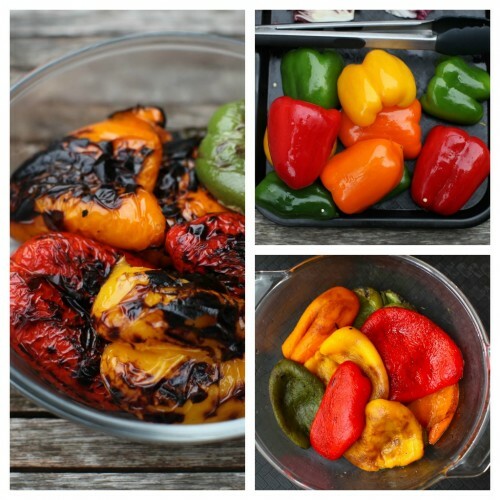 You can either grill your peppers, or roast them in the oven, both will cook the bell peppers nicely and bring out their sweetness. Wash peppers and cut in half from top to bottom. Use your hand or a small pairing knife to remove the seeds. Oil peppers lightly with olive oil and place, cut side down on a roasting pan or preheated gas grill. Roast or grill sweet peppers until the begin to char, about 15 minutes, depending on the grill. Grilled peppers should be flipped so the skin side can blacken, but roasted peppers will char on their own. Remove peppers from heat source and place in kitchen bowl. Cover top tightly with plastic wrap and set aside for 10-15 minutes. As the peppers cool and sweat, their skins will loosen. Using your hands, slip skins off of the peppers and discard. Rinse peppers quickly under cool running water to remove any clinging skin or seeds. Roasted peppers are now ready to be used. A wood-burning pizza oven is one of our long term goals for our little urban homestead, but until that happens, grilling pizza is about as close are we are going to get to the coveted smokey flavor and slightly charred bottom of a wood-fired pie. Tossing a round of pizza dough on the grill isn’t complicated, but does require close attention for best results. I recommend you bring your iced tea along and camp out close to the barbecue for this one. Have all ingredients prepped ahead of time and standing by the grill on a tray or cookie sheet. 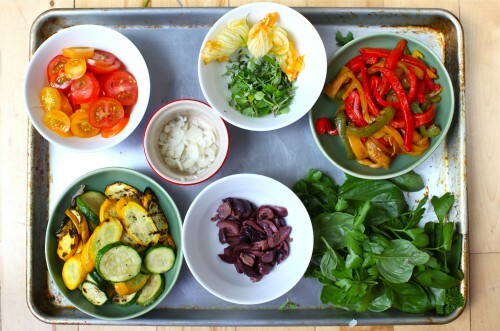 Grill some toppings ahead of time, such as zucchini, peppers and onions, to to add flavor and to also cut down on cooking time. Don’t go too heavy on the toppings, or the crust will be cooked before the rest of the ingredients are warmed and the cheese melted. High heat will produce lovely markings, but finish pizza on the top rack with the lid down to help the cheese melt. Prepare dough and set to rise. Prep toppings and have them ready to go. Preheat grill to about 400, clean well with a brush, and oil lightly with a long handled brush. 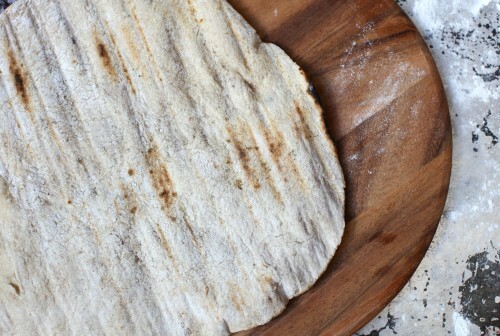 Divide pizza into 6 portions and roll then into rounds. Dust them well with flour, and layer them on a baking sheet. Place the a round of dough, floured side down, above the oiled grill and cook until the top of dough bubbles and bottom is grill-marked, about 1-2 minutes. With a long-handled spatula, flatten the bubbles. Brush the top with olive oil and flip the pizza crust over, then transfer it to the top rack on the grill. Quickly spread tomato sauce onto grilled dough, top with cheese, herbs, roasted bell peppers, and zucchini. Close lid and let dough brown and cheese melt until bubbling and slightly browned, about 5 minutes. Remove pizza and repeat remaining rounds of dough. Serve at once. What do you like to top your summer pizza with? That looks so good! Onions, sweet peppers, spinach and sauce. Spinach on pizza rocks, I quite agree! Yum! I love roasted peppers but have never made my own! Will have to give it a try when we get some peppers in from the garden. My favorite pizza toppings are onions/spinach/greek olives…and don’t forget the red pepper flakes! Heh, you’re right. Although I don’t do spicy peppers when I’m nursing, my dad had me hunting for a jar for his pizza. I love carmelized onions, goat cheese, and a little fresh thyme. I’m also thinking this could be yummy with honeyed ricotta and some of the grilled fruit salad you posted about recently! Oh man, I’m going to have to try that now. Grilled fruit pizza sounds like heavenly summer fare. Yes! I’m totally with you (well, obviously, since I don’t eat meat)… but I’m with you! Who needs meat when you can put all of this amazing seasonal produce on your pizza? And herbs! Oh gosh, I’m going to have to make pizza this week… I now have a serious craving for it. Looks so good!!! I will be doing this for the 4th! Enjoy and happy Fourth of July!!!!! Roasting peppers is something I learned this year. It’s easy and cheaper than buying them in the jar. I wonder….do you think they would freeze well? Then you could stock up when the peppers are sale and roast a bunch and freeze. They do freeze well! Better than fresh, blanched peppers, anyway. I suggest you pack them in a bit of olive oil before freezing, as this will help guard against freezer burn. I hope to tackle grilled pizza this summer. Yours looks great! You won’t regret it, Rachel! It’s a fun little party meal. I put out the toppings on the picnic table and let my friends build their own pizza. We love grilling pizzas here. A great way to keep the house cool and continue pizza night. Are you guys suffering through the heat up there like we are? These are the weeks when “EVERYTHING grilled” becomes my mantra – pizza included! 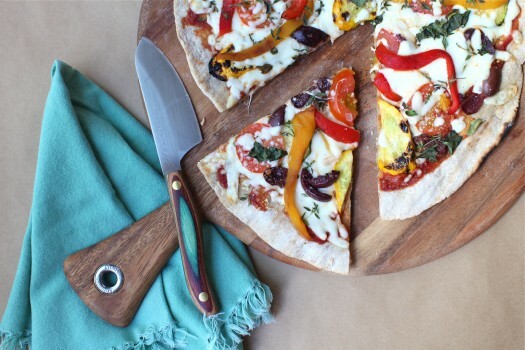 I love grilled pizza and that it only takes a few minutes to cook! Sometimes I throw my pizza stone on the grill to make it even easier. I made pizzas for 25 kids for my sons birthday party, grilled up the crust the day before and reheated with sauce and cheese just before serving, made it much easier and the kids all loved it. Great post, Aimee! We love grilling pizza, but typically just used roasted tomatoes out of the jar. I’ll definitely give method a try! Grilled pizza is the best!! We were just talking about how we need to make more than we do during the summer 😀 Love the tips! I can’t get enough of grilled pizza. Yours looks like summer perfection!